1. Picking Up Passengers - Before you leave to pick-up someone from the airport, check flight arrivals. You may pick up passengers at the arrivals curb directly outside of baggage claim. Note, however, that there is no stopping or waiting with your vehicle at the curbside. 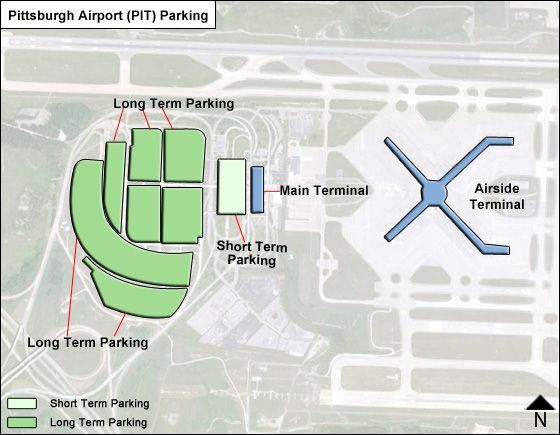 If you wish to wait for your party, park your car in short term parking (see below), and wait for your party inside at the baggage claim area. 2. Short-Term Parking - Hourly/Daily: Best for parking less than 24 hours, and convenient for dropping off and picking up passengers. 3. Long-Term Parking - Hourly/Daily: Best for short trips with tickets/carry-on luggage; ideal for shoppers/sightseers; or use for drop-off/pick-up. 4. Extended (Economy) Parking - Daily only: he most economical lot for travelers on long trips. Free shuttle service. 5. Valet Parking - Tel:412.472.3001, Fax 412.472.3396 - Service 24/7, no appointment is necessary. Each add'l day - $19.99. Other Valet services: Car detailing either inside or outside - $99.95; a complete detailing is $169.95; oil change for $38.95, changing wiper blades for $29.95, hand wash for $14.95, automatic wash for $9.95, vacuuming for $9.95 and rain repellent to front windshield $9.95. Can EZ pass be used to pay for long term parking? Can I use EZ pass to pay for long term parking? Is there a discount for parking if you have a GOFASTPASS?